This is a wonderful business…..
….and this resource is designed for those who have decided they want to be a part of it, or are already immersed in the industry and either need a helping hand, or a boost to take their business to the next level. My name is Heather Bayer and I am the co-founder and Chief Story Teller here at Vacation Rental Formula. I bought my first property for vacation rental in 2001 and since then have grown one of Ontario, Canada's largest rental management agencies. This road map was created from all of the wrong turns I made over the last few decades to help you find your path to success sooner and with less heartache. Perhaps you have owned a second home for years, but don’t use it as much any more. Or you’ve been renting it out haphazardly and could benefit from a more structured approach. Maybe the time has come to expand and grow and start managing properties on behalf of other owners. But it’s tough to find the information and support you need to know you are getting it right from the start. What you need is a blueprint…a road map…..a formula to follow. A method of taking action that you know will work because it has worked for others. You see — all vacation rental owners and managers go through the same processes, and from beginner to seasoned pro, they look to get better every step of the way. We are here to explain how they get this done and achieve great results. "What you need is a blueprint…a road map…..a formula to follow." Lets look at what’s involved in…. The word brings to mind chemical equations and mathematical concepts and conventional statements. For us, it means a recipe that has been tested over and over again to make sure it comes out right each time. But any recipe can be adapted to meet differing needs – the availability of ingredients or for the specific taste of the consumer. So, this formula is grounded in trial and error to create a solid foundation, then enriched with the variability of a diverse population of owners and managers and…of course…guests. The formula is what successful owners of a single property have used to create a comfortable income, and the same one that managers of multiple properties have applied to ensure constant growth. It works because it draws every aspect of good vacation rental business practice into one clear blueprint for success. We’ve used it as the foundation for the successful purchase, set up, operation and management of multiple independent properties. We’ve used it to grow a property management business from the ground up, to a profitable and saleable business that supports a very comfortable lifestyle. Before you go further, think a moment about what you want out of this business, because a commitment to success should be your primary goal. This isn’t easy and no-one who really knows what this success looks like can tell you any different. But it’s a lot of fun and is hugely rewarding for those who take the steps to make it happen. So what is this formula about? What can it teach you that you don’t already know? What if you are half-way there already and just need the proverbial kick to get you moving? ?…there is little point or profit in understanding the component parts of it without being able to see the big picture. NB: Click to jump to that step! Pay close attention now - we’re about to reveal the exact process we’ve used to buy, set up, and fully book our properties, and how we grew a rental agency from 5 to 200+ homes. "There is little point or profit in understanding the component parts of it without being able to see the big picture"
Not that long ago, it was primarily boomers who owned vacation rental properties that were often much-loved second homes. The owners simply wanted a little second income and opened their doors to paying guests mostly on an ‘as is’ basis. That meant they didn’t do much in the way of preparation or clearing up, or even in creating any type of welcome. Guests (they were known as ‘renters’ then) were generally happy to experience the lifestyle on offer and willing to overlook the oddities of self-catering because it was a new and unique way of living the life of a local. As vacation rental grew in popularity, so more investors saw the benefits of buying solely for the purposes of short-term rental, and what was essentially a mom and pop business began to mature into a full-blown industry. …with people from every walk of life; millennials, entrepreneurs, young families, as well as retirees now getting involved. …with vacation rental listing sites that have grown from being struggling start-ups offering free listings, into multi –billion dollar companies. …with the consumer demand, competition and media focus that a rapidly growing industry must deal with every day. And every day, more and more people want their piece of the action. So things have changed…and changed dramatically! We are no longer able to capture the attention of the traveling market by putting up a sign on the lawn, or an advert in the local grocery store. The days of the ‘rental directory’ the size of a phone book are gone. No-one wants to fax an agreement or even spend more than 10 minutes on a transaction from beginning to end. Paying by cheque is no longer an option – and who has them anyway? And having to manage a whole range of other issues from the ground level of neighbour relations to local by-laws all the way to growing state/provincial and federal involvement. It’s no longer a matter of throwing out opening the place up and expecting they will come. That won’t happen any more. be prepared to learn and adapt to meet the ever-changing landscape of short-term rentals and flexible enough to make the changes. Your target market and where the majority of rental guests come from to your location? Who your closest competitors are - their rates and where they advertise? the dollar value of the maximum amount of vacation rental days you can offer? how to find the industry information you need to stay informed and up-to-date with changes in the industry? the legislation and regulations that apply to vacation rentals in your area? what differentiates you from your competitors and know exactly what they do better than you? all the websites, blogs and forums relating to your specific niche? all your local activity providers and keep a spreadsheet with their web site addresses, email and telephone numbers and with their valuable content highlighted? "As vacation rental grew in popularity, so more investors saw the benefits of buying solely for the purposes of short-term rental, and what was essentially a mom and pop business began to mature into a full-blown industry." >> THIS IS A WARNING! There is a lot of material available on marketing a vacation rental yet there is little point in becoming an expert in, for example, Facebook advertising or Search Engine Optimization (SEO) or building your own website, in and of itself, if you don’t have a solid product to promote. Now this goes back a few years but it’s worth the telling because it shows just how far the industry has come in the past twenty years or so. My first trip out to Canada in 1998 was to a family wedding and we (all 12 of us) stayed in a ramshackle cottage perched on a rock overlooking a beautiful lake. We’d stayed in vacation rentals in the UK and had fairly low expectations which were certainly met. The place hadn’t been given a thorough clean in years; the bedding was damp and mildewed; the holding tank was full so we could not use the indoor washroom but hey…there was an outdoor ‘dunny’ that was adequate as long as we didn’t mind sharing it with a trillion mosquitoes. We didn’t bother too much with indoor entertainment as there was too much swimming and fishing to do, until the storm came and knocked the power out for 2 days. Sitting round the campfire is not as much fun in the rain and wind, so in we came and played as best we could with half a set of Monopoly (no dice) and a pack of 49 playing cards. Every kitchen cupboard was full of stuff. From opened packets of flour and pasta (that the mice had found long before us), to a mish-mash of pots and pans long over-due for replacement, and the ubiquitous rusty potato peeler and blunt knives. You might think this is a horrendous tale and we should have hotfooted it out of there, but that was pretty much standard in those days. Like the time we arrived at another rental cottage after an 8 hour flight and a four hour drive to find the owner there to greet us….well I think that was his intention, but his previous nights revelry had got the better of him. He opened the door bleary-eyed and said he’d just woken up and the place wasn’t ready for us. Two days later I had the place cleaned, had bought sheets and towels, and we were settled in, but the experience was enough to get me thinking about how I would do it differently. Fast forward to today and I’ve rented out 6 properties of my own and managed another 200 on behalf of other owners. This business has changed almost beyond recognition and although there are still a few dinosaurs left out there thinking their properties are a good home for cast-off furniture and yard-sale junk, successful owners have a very different perspective. 1995 - Possible indoor plumbing, TV with rabbit ears and a cassette player, a few old jigsaw puzzles and a well-used pack of cards..mice came as standard. No welcome book. Bring everything. 2000 - Washing machine, bigger tube TV & boom box, jumbles of pots and pans and cast-offs; blunt knives and a rusted can opener. Welcome book is 2 sheets of coffee stained paper with instructions on how to turn on the water supply and where to take the garbage. Bring bed linens, cleaning supplies and toilet paper. 2005 - Dishwasher, ensuite bathroom to master bedroom, bed linens a little threadbare but passable, used furniture, clock radios, fridge without owners food inside, stereo system with multi DVD player. Welcome book is 3-ring binder with paper in plastic pockets and tourist information from 3 years previously. 2010 - Flat screen TV with satellite or cable & DVD collection, iPod docking stations, baby gates and safety equipment, duvets with removable covers, themed children’s bedrooms, clean but basic kitchens, non-stick pots and pans. Property Manual has lots of graphics, instructions on using all the appliances and some restaurant reviews in a custom binder. Bring food and beverages. 2015 - Complete entertainment systems with large screen TVs, Wii or Play Station; unlimited Wifi for streaming Netflix; all king or queen beds or twins for children; charging stations for devices; concierge services; high quality kitchen equipment with stainless steel appliances; 500 thread count sheets; property information is displayed on iPad with welcome video. 2018+ - All of the above plus instant booking, shorter booking periods and easy cancellation options. Communication via text. ...And today’s guests are more demanding than ever. When they don’t get what they expect or want, they will head to social media and the review platforms to vocalize their displeasure…more of that later. We always have to be one-step or several strides ahead of these demands and expectations, and when you do this you’ll find you are prepared for them. Getting prepared means outfitting every room with the furniture, amenities and facilities that your target market expects, and then exceeding those expectations. And anything else you can do to make your property better than your guests’ home because that is what they now expect. "We always have to be one-step or several strides ahead of these demands and expectations, and when you do this you’ll find you are prepared for them." Marketing for vacation rentals used to be a simple matter! ...Seriously, it was as easy as that. The site was VRBO and it was the pioneer in the market that has morphed into the massively competitive behemoth we have to contend with today. Enter the dawn of the Online Travel Agency (OTA). VRBO is still there as a part of HomeAway which is now owned by Expedia; the old favorite Flipkey has been swallowed up by Trip Advisor. Booking.com is the fastest growing accommodation website in the world, and more hotel chains are moving into the VR space. You must wonder how your listing could possibly be seen and you are not alone. Let’s say you have a villa in Orlando and pay for a premium listing in the expectation it will push your listing up the rankings and get it seen by many more people. But there are a huge number of properties in the Disney area and you can bet that a lot of those owners are thinking in exactly the same way as you are and fronting up with the premium fee. Even if only 1% of owners did that, you would still have to fight the 300+ others who have the same expectations as you. And on top of that you have to contend with the algorithms that push properties likely to make the OTA's more income into the spotlight. It’s pretty much a no-win situation if all you do is list on the big sites. You have to do more. Much more. Is it worth it you ask? Maybe not, if you are not interested in getting a little work done, moving the bar up and growing your visibility. But I am thinking, since you are here and have read this far, you do think it’s worth working at. So here is what you have to do to market your vacation rental and really see results. Without a doubt you will need a website if you want to achieve maximum independence from the major listing sites as it’s the foundation for all your marketing efforts. Whether you do it yourself, hire a web designer or use a site such as Lodgify (A), OneRooftop or MyVR , the outcome should be a well-designed, easily-navigable, content-rich site. Most sites you see now have wonderful high-def images that capture the imagination and create desire right from the start. You need to invest in this and take it seriously! Once again, visitors want to connect and having a name for the property just it easier for them to identify the place and remember it. This doesn’t have to be the same as your property name. For SEO purposes you might want to find a name that reflects the location and is more along the lines of the keywords visitors are likely to use. When your combined marketing efforts sends people back to your website you have to give them great content to read. A list of amenities is simply not enough. Your goal is to make it sticky…that means you want people to stick around when they get there…so giving them a lot of local information positions you as an expert. Even if they don’t book this time, they will come back to your site to get the info. This is why book stores have plenty of comfortable seats, a coffee shop, a kiddy play area and other stuff for people to browse. Fewer are buying the books but they want to keep the customers coming…and one day they will buy that book. Having content that delivers all the information they need to plan their trip can make the difference between a reservation and a click away from your site. This is where you can shine as a location expert and it’s not as difficult as it may seem. If you love your location, you’ll be able to write about it and share the best parts. OK - Here it is! You’ve been expecting it, so don’t hide away. You cannot get away from it. But social media has now moved in distinctly separate areas and if you can get to grips with this, you'll have a great understanding of how it can work for you. Strategy works with all the socail media platforms ad you need to know what to do to make each one work for you. This is where you get to show how much you know about your location by sharing images, content and links to other interesting sites. 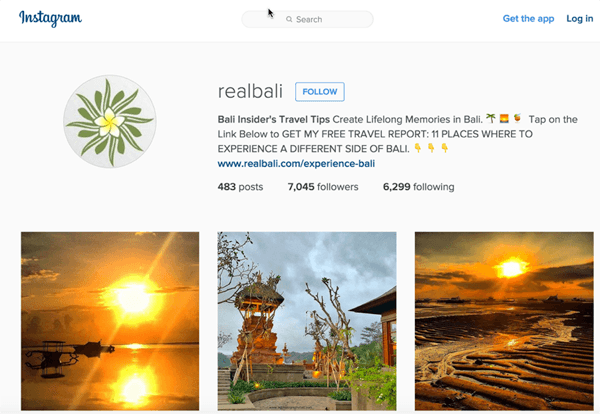 Thibault Mason does this wonderfully on his Instagram account - he has one for St. Barts where he has two villas, and one for Bali for the two homes he has there. Did you notice this on Thibault’s page? 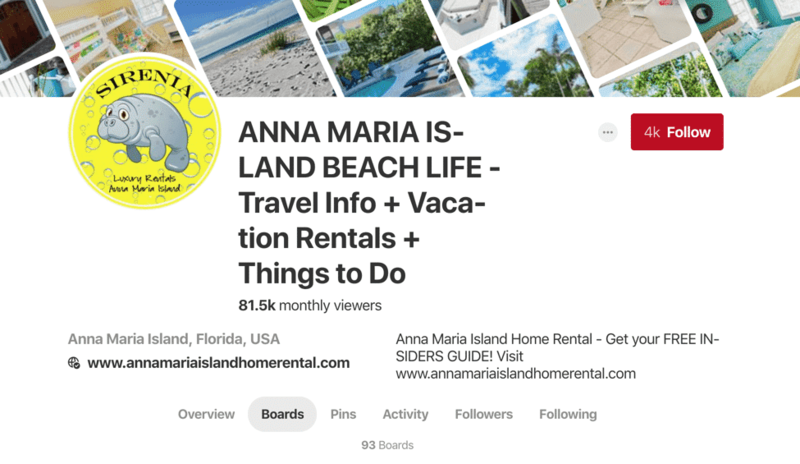 Nancy McAleer and Terri Mason together with their husbands, own properties on Anna Maria Island and rock their social influencing on Pinterest. They have created 93 boards promoting everything and everything to do with vacationing on the island and have over 4000 followers. In the old days, if we had something we wanted to get out, we used a press release – a statement sent to a range of journalists and writers that we just hoped would stand out from the hundreds of similar pieces they received every day. Nowadays you need to find out where the travel writers and bloggers hang out and begin engaging with them. Social media should not be used to direct market – by that I mean to constantly tweet, blog, post images of, and brag about your home. Instead, reach out to your audience and get to know them. The world is out there on the airwaves saying what they want, asking questions and looking for advice. Have you ever checked out the TripAdvisor Forums? This is where prospective travellers go to ask questions about locations, and the answers are there for everyone to see. Let’s say you are an owner with a property in Maui. 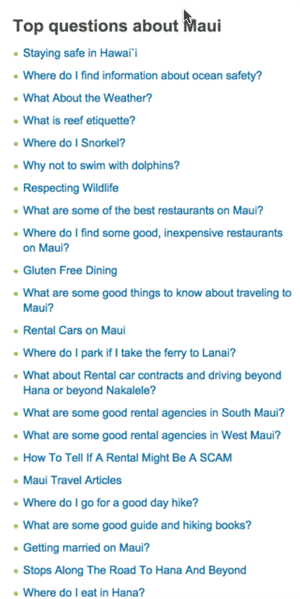 Travellers ask a lot of questions about their destinations and checking out the Maui forum would be a great way of finding out what they want to know. There is so much you can do with this information. Or just answer the questions as you find them by sharing your local knowledge. People are asking plenty of questions on Twitter as well. You just need to be there to hear them. This is where you get to actually drive people to your website but they will rarely go there without some engagement with you first. If you succeed at listening, influencing and networking, then the selling part may be the easiest of them all. The Calls to Action (CTA) that you use on your website and in your social media engagements should have the goal of getting people to book. People come to your site (if you have one) every day, look around, and let’s face it, the majority of them will move on without booking. If you can capture their email address and offer to send them information on your location and a regular newsletter, you have generated a subscriber. You’ll need an autoresponder service – such as Active Campaign, Aweber or Mailchimp to add the email addresses to a list, but once you have that you can set up a sequence of messages that are automatically sent. Then you broadcast with topical news about your specials and deals directly to your list. The more your list grows, the more people are given the opportunity to come back to your site…and are consistently reminded about it. Have the document professionally prepared with graphic design and artwork. Use Fiverr (A) or find a designer on Upwork. Create an autoresponder series of emails to send as soon as a prospect has downloaded your lead magnet. Use a double-optin format to ensure the people signing up realize they will continue to get email from you. This also keeps you within Can-Spam guidelines. Create a newsletter template and send newsletters monthly to keep your list informed of special offers, upcoming events and topical news. "Without a doubt you will need a website if you want to achieve maximum independence from the major listing sites as it’s the foundation for all your marketing efforts." So you’ve done the research, the property is set up and staged, your marketing plan is in place and you are ready to rock and roll. Let’s get those bookings coming in! But just hold on a moment…..
Before you get to this point you have a little more to do, to make sure that everything goes smoothly. And this for some could be the boring stuff – the systems and the processes that you must have in place before anyone walks in the door or even reserves a vacation with you. When I first got into the vacation rental business I thought I could do it all on my own and I was so wrong. I knew I needed a website so I tried to learn how to use Wordpress which took a massive amount of time, was frustrating and stressful, and the outcome was clunky and ugly. My business systems were home-made with spreadsheets, paper calendars, a lot of post-it notes, and irritation when someone else couldn’t figure out how to navigate them. And I double-booked someone! My photography was pretty poor. The images seemed OK but when compared to the competition that had used professional photography there was no comparison. I decided to do my own changeover management – and wasn’t emotionally detached enough to walk in to a recently vacated property and not get upset by the way guests had left it. And no-one ever left it in a really poor condition – it just was not to my personal standard, and I got unreasonably stressed and annoyed. There were no processes in place to deal with things like cancellation, or the weather delaying a guest arriving, or the TV breaking down, or an epidemic causing owners in our agency to demand their properties back for their own use (yes, this happened in the SARS outbreak in Toronto in 2003). My properties were advertised on several sites – I knew enough to do that – but it was all done manually. Every time I got a booking I had to update several calendars, and any minor change or amenity addition or new photo required time to amend three or four listings. Because I was so determined to have control over every aspect of my little business, and wasn’t prepared to invest in help, I got bogged down with the technical aspects, and the strategy suffered. 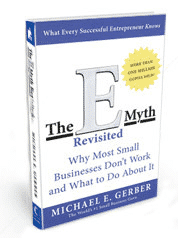 The best book to read about getting a business up and running and making it profitable is the E-Myth Revisited by Michael Gerber. It’s not a mighty tome by any means, but there’s a lot of wisdom in these pages in terms of how you manage your processes. The Entrepreneur would be free to forge ahead into new areas of interest; The Manager would be solidifying the base of operations; and The Technician would be doing the technical work. Each would derive satisfaction from the work he does best, serving the whole in the most productive way. Unfortunately, our experience shows that few people who go into business are blessed with such a balance. Instead, the typical small business owner is only 10 percent Entrepreneur, 20 percent Manager, and 70 percent Technician. Most vacation rental owners and operators of small property management companies are typical small business owners. We work IN the business 70% of the time, rather than concentrating on working ON the business which is the path to success. I’m assuming you are familiar with the expression – “Jack of all trades, master of none”? "Jack of all trades, master of none" is a figure of speech used in reference to a person that is competent with many skills, but spends too much time learning each new skill that he/she can not become an expert in any particular one. To succeed in this or any business you need to get Jack out of your head and invest in the help you need. Believe me, this is money you need to spend, because in the long run the savings are huge! There is no longer any necessity to do the tech work yourself – there really is an app for everything……. A good reservation system will streamline the booking process from the moment your engagement with a prospective guests becomes a commitment to book. For them it should be a simple online process to fill in a form, send a payment and receive a confirmation. No interminable email correspondence, scanning or faxing of documents, and posting cheques. Just a quick and easy few minutes booking a longed-for vacation, or even a last-minute getaway without any hassle or time spent on unnecessary. You can still communicate with them and show your hospitable and welcoming side, but take the pain out of reservations. There’s a huge range of reservation systems available, ranging from simple systems for owners of one property to vast feature-filled (and very expensive) booking software programs. Deciding which one works for you is important because you don’t want to change horses in mid-stream, and if you are planning on business growth, you need to choose the right one that will support that from the start. 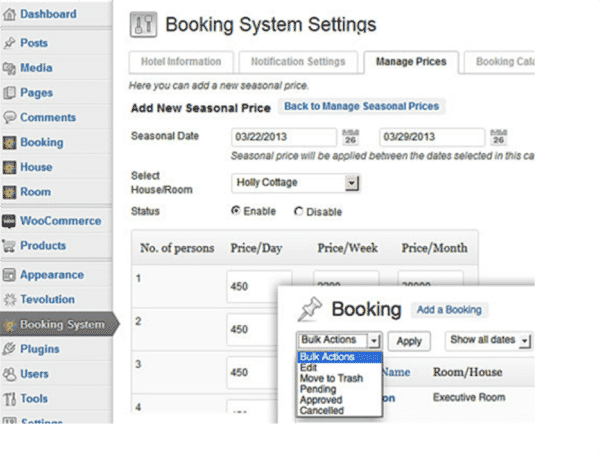 Don’t forget that you’ll be using the online travel agencies (OTAs), such as Airbnb, Home Away and/or Booking so it’s essential that whichever one you choose will integrate with their systems so your calendar updates seamlessly on each reservation. Whoah…hold on…I hear you say! Over time the vacation rental industry, like any other, has spawned its own collection of jargon, so it is worthwhile understanding these, so you can talk VR like a pro. One area you will need to work on, because this is determined by your own choices for your vacation rental business are your internal systems and procedures. This identifies the specifics of the agreement – who the parties are (you as owner or agent and the guest); the period of the agreement (check in and out dates and times); the fees/rates payable (including damage deposit); the date range for payment, and the signatories to the agreement. These lay out your policies on booking and payment, cancellation, pets, smoking, use of amenities, damage deposits, cleaning expectations and waivers of liability etc. Yes, the most important bit! Your guests want to easiest way to pay you. And when they are excited about booking and have credit card in hand, you want to secure it then and there. Don’t ask for a cheque or money order. For the first, very few people have cheque books anyway so this might necessitate a trip to the bank, as does the second. You can easily lose a guest at this point because it’s just too difficult. Don’t ask them to wire money. This is the playing field of scammers and will raise enough red flags to cause them to move onto another, less risky option. There are a multitude of payment processing options from online transactions into your own account to using the listing sites instant booking systems, to good old PayPal. Research them all and find the one that is best for you. Now, you are good to go and the fun stuff begins…. "A good reservation system will streamline the booking process from the moment your engagement with a prospective guests becomes a commitment to book." Getting great reviews is an obvious goal but it is much more than an origami towel arrangement and a bowl of fruit on the counter top. Creating happiness in your guests is a tall order and it requires attention to detail from beginning to end of the process. Everybody shares what they are doing and there are bragging rights to every choice they make. This is no different for your guests. From the moment that booking is made they will be sharing where they are going and what they plan on doing. Your listing and website are what they will show their friends. Their level of satisfaction in that choice can be determined by the reaction from those friends. So, let’s look at what you need to do to make sure your guests are happy with their decision from the moment they book, to the time they write their review. The quality of the photos and text that accurately portray the property. This points to the responsibility of renting out your home and becoming a provider to the tourism market. Take that responsibility seriously and your business will succeed, and we are here to help you make that happen. "Creating happiness in your guests is a tall order and it requires attention to detail from beginning to end of the process." All of the above applies to everyone and anyone renting out one or more properties. This business is addictive and when you experience success and become super-competent at managing your own places, you may wonder what the next step is to grow your passion further. So, let’s say that’s where you are now. You’ve been doing short term rentals for a few years, understand the challenges involved in an industry where disruption is the norm, and still thrive on them. Now you’re beginning to think you could make this a sustainable business, market and manage more properties and perhaps take on some staff. And here begins the next chapter...woot...woot! Steve Milo of VTrips (formerly Vacation Rental Pros) heads up one of the largest property management companies in North America. Starting in 2002 with his first purchase in Florida, he now owns several vacation rental homes and management companies throughout Florida, South Carolina, Tennessee, New Mexico and Hawaii, with over 2000 homes in the VTrips portolio. While emulating Steve may be a lofty goal, it’s worthwhile studying how he did it, and why he says efficiency, automation and lean management is the key to a successful property management business. He ran the company by himself until he got to around 125 properties. Now with offices and staff all over the US, he is able to do what he does the best – strategic growth management. If you’re already running a professional business a good start is to review your five year plan and then expand it to encompass the wider vision of managing additional properties. How many properties are needed to finance a full-time business? What are the strengths, weaknesses, opportunities and threats related to the business plan? There is likely to be competition wherever you are located. 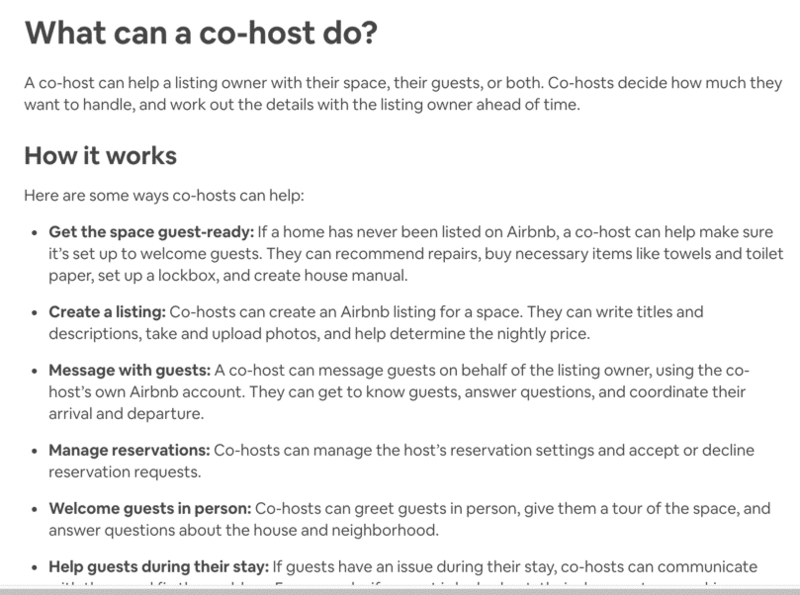 Airbnb has made it much easier for hosts to become managers (co-hosts) so there’s an element of the Wild West in some areas with numerous start-up property PMs. The limitations of the Airbnb co-host model is in the set up that disallows any marketing on other listing platforms. While this may be perfectly acceptable in urban markets that are predominantly Airbnb focused, the target market in destination locations may be looking on HomeAway, VRBO and Booking.com, so confining marketing to one platform makes no sense economically. About Us page (is it bland and generalized or personal and inviting? Then do a secret shopper exercise and make an enquiry as if you were a guest, and then as a potential owner. What is unique about their response? What communication systems to they use? That’s just a few of the details you should be looking for to feed into a competition spreadsheet. This should provide plenty of data to analyze, and allow you to figure out what other successful PM's are doing that works. "Airbnb has made it much easier for hosts to become managers (co-hosts) so there’s an element of the Wild West in some areas with numerous start-up property mangers"
Once you get to the point of managing for others you will need to consider your brand. How will potential guests find you, and tie in the property they have found on one of the major listing sites to your new company? You want your guests to know they’ve booked with your company rather than Home Away or VRBO, and that’s a challenge. The key to a great marketing strategy is knowing who your target guests are – your personas. If you’ve already done this for your own homes, then it’s just a matter of adding your new properties to the platforms that are working for you. However, if your research uncovers a new niche it could open up other opportunities for marketing. For example, listing on the primary sites may have worked for your personal properties but now you have some different styles of property that lend themselves to some more niche-oriented sites. Perhaps they are pet-friendly or family-focused, or tiny homes that would be more suited to Airbnb. Having a good website that showcases all your properties is essential, but don’t rush into that before considering all the options. Many of the reservation software providers include a comprehensive Wordpress site that you can adapt to suit your brand and style. The good news for new property managers is the wealth of resources there are available to help you to help bring traffic to your site, and create the best experience for your guests. There are literally hundreds of different topics we could cover on Marketing but lets focus on some of most important areas you need to make sure you have in place. We have mentioned this before but we can't stress how important it is to ensure you are directing your marketing to a specific avatar. You brand and message needs to solid and consistent and the only way to do this is to define who your company is trying to serve. How your company is seen is essential to giving a great first impression. When you are entering the wild west of VR property management you need to stand out to guests and potential owners and you want to be remembered. Professional logo and design is now essential and not optional with your design consistent across your website and social media platforms. Complete control of your website is now vital. If you built your first website through a third party provider like Wix, MyVR or OneRooftop then it might be time to migrate to a custom site with integrated booking software. Lodgify is more robust system that is well suited to growing property managers but we will always recommend not building your business on rented land. Ensure you are full control and ownership of your platform. Selling online is nothing new but if it's new to you then you need to realize the most important aspect of building a relationship with a customer online. You are working with people...not computers. Don't try to sell to anyone without first building their confidence in your ability to provide them with an exceptional vacation. ?The personal interaction with your guests goes a very long way to building a relationship but this can be very challenging the larger your business becomes. You can certainly leverage technology to automate a great deal of your business but never forget that a phone call, text or DM can make the world of difference in the opinion that will be formed of your business. "Your selling strength is in your email list." This is a long used phrase in digital marketing. It is no different from the rollerdex in the 1980's. The more 'nurtured' contacts you have that you can sell too directly the higher the probability of making more bookings. Nurturing your email list is the key. If you just have a big list of email address and these contacts only hear from you once a year then your booking rate is going to be quite low but have a list of contacts who are engaged with your business, your message and your service the more likely they are to book again and again. The worlds most powerful marketing companies run their campaigns almost completely on auto pilot. You are not one of the worlds most powerful companies but the technology is available to you (very inexpensively) to have a system that will run 24/7 365 with just a small amount of input. The aim of the marketing game is to move people from being a cold lead to a hot lead automatically. So what is the automation part? You know when you have gone shopping on Amazon and looked a product but not purchased it. For the next 24-48hrs ads for that exact item will show up all over the place. It might remind you to go back and get it or might remind you to go back and finish looking for the a better deal or another item. That is automated marketing called retargeting. Airbnb and the Expedia companies (HomeAway, VRBO) are doing it very well now. A guest will look at a specific property and then leave the site, for whatever reason. Ads for that specific property and ads for the area that property is located will now be presented that will remind the shopper of what they were doing and may ultimately remind that person to go back and look again or book. ...now lets get you some more traffic to your website. You can't just build it and they will come... you have to drive traffic to your website and you business. Before you start driving the traffic to your site you should make sure you have a way to monitor your analytics to see what is working and what is not. Traffic Source - Where is my traffic coming from? Top Pages - What is my most popular Content? A good place to start viewing this information is Google Analytics but if you are looking for a more advanced platform that can collect data from all your marketing efforts then try Wicked Reports. Content that provides value to the reader. Typically not focused on your properties or your business but tells a story or showcases the area your business is located. One of the best examples we have found of a website that provides immense value but is not doing the hard sell is SmokyMountains.com. With a great blend of topics on the blog for each major town this is a great way to provide value to a potential guest. N.B. Note how on each blog post there are links to related properties in the area and calls to action suggesting the reader to 'Book Now'. Social Influencing, Social Sharing, Social Listening and finally Social Selling. Reread these topics as these are very important part of your overall strategy. We mentioned retargeting briefly but this is so essential its worth mentioning again. It is also free. Using your Facebook Business account and your Google Ads account you can add the retargeting pixels from these services to your website that will allow you to focus any paid marketing efforts to people who have already visited your site but who many not have given you any contact information. So this is a big step for many and also where you can loose a lot of money very quickly. Facebook Ads and Google Ads gives you the opportunity to market and re-market to all your leads whether they are cold, worm or hot. Not as important for the individual property owner but very important for the property manager to stand out from the crowd. Here is where a well written and thought out content strategy will do you very well. Some say this is a lost art and very challenging to master... they are not wrong but it is worth the effort. Hiring a good copywriter who is also well trained (and stays up to date) with the ever changing algorithms of SEO will also be very valuable. This should still be an element in your toolbox however this is also a task that should be outsourced as you want to be sure your press releases are well targeted. We have seen create success with Abode PR and their Director Jessica Gillingham. As a PR company that is focused on PR for property managers they are very well positioned and practiced to support your business. "You want your guests to know they have booked with your company and not Airbnb or VRBO and thats a challenge." Property owners are the lifeblood of every property management company. Without them you have no inventory to offer to rental guests and the business would struggle. 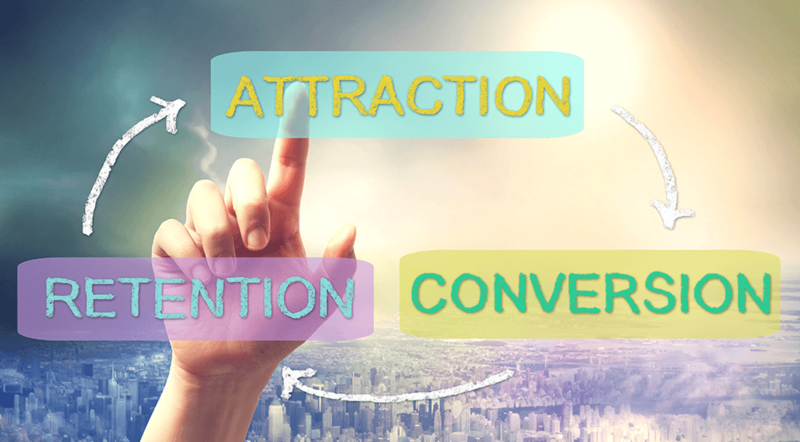 The mistake many new property managers make is to concentrate on marketing for guests and not working hard enough on an owner attraction strategy. Without a track record, it can be tough, so the trick is to double down on the niche and create some professional marketing tools that will show potential owners that you have significant experience, a clear marketing strategy to promote their homes, and a focus on longevity, with at least a 5 year plan you can share with them. Web pages that describe how your owners will benefit from working with you. A professionally produced information package that delivers additional information to interested owners. A list of property standards outlining the minimum features a home must have before being accepted onto your register. Marketing automation strategy that clearly defines the steps that will take a potential owner client from initial contact to conversion. An on-boarding plan that details how a new property will be registered onto your rental program. A series of Information sheets to send regularly to potential clients to show your expertise and keep your company in front of their minds. Management contract that sets out your responsibilities as a manager and their responsibilities as an owner. For some owners, the opportunity to get in on the ground floor of a start-up PM company with some unique ideas and perhaps a preferential commission rate, may be enough for them to sign up. Remember their primary goal is income, so focus less on your great website and nifty apps, and more on your commitment to their goal. "You want to make sure that the money you put into paid advertising is putting ads in front of people who are more likely buy!" While you may have systems already in place to manage your own property or properties, moving onto third party property management takes you into a completely different professional sphere. If you are convinced that Airbnb co-hosting is the way to go, and you will never market outside the platform, there is probably no reason to read further. Airbnb has all the features to help with setting it up, and even though they have removed the function to payout co-hosts directly, the structure is there to manage most other aspects of the process. However, in most locations, it’s worthwhile marketing more widely and including other platforms in your strategy. If this is the case, you have more work to do and will need to set up systems independent on those Airbnb offer. VTrips would not be the success story it clearly is if Steve Milo hadn’t automated his key processes from the start. Steve knew he wanted the company to expand so he chose Escapia as his reservation system – a higher end platform that was capable of scaling as the business grew. If you have hundreds of properties as your goal, explore some of the the fully featured options such as Liverez, Streamline or Cirrus – otherwise a more modest option may work just as well. Automation isn’t limited to taking reservations. You will need to collect and file lodging taxes for multiple properties, manage cleaning teams, and communicate efficiently with guests. When you start looking at reservation systems, consider how they can connect into your accounting software as this can impact how automated your processes can be. When a reservation can be taken and the funds automatically distributed to vendors and owners, with different levels of commission applied, this makes managing multiple properties much easier. When so much background work can now be done at the touch of a button, your time is freed up to focus on other aspects of your company that needs a personal approach. "Moving onto third party property management takes you into a completely different professional sphere." ?Steve Milo was up to 125 properties before he hired his first staff member to help with booking and administration. It’s not necessary to wait until your portfolio grows to that level before taking on a first employee, and in the early days you may just want some part-time help. For many people taking the first steps into property management, they want to do everything themselves. They’ll spend countless hours learning about all the software that’s available, get involved with social media marketing, do their own bookkeeping, take all the property photos, deal with guest inquiries and problems, worry about all of it, and burn out in the first year. It’s the story of many entrepreneurs…..and it’s my story. When I started a property management company, I thought I had to do it all myself because how could I possibly afford to hire someone from the get go? And on top of that, letting go and appreciating that someone else could do some of the things I did..and better…was a tough one to accept. If I had the chance to do this over again, I’d do just about everything differently. ?I’d be hiring earlier, and more intelligently; working to a strategic goal; giving up the stuff I thought I needed to learn to someone far more skilled than me, and growing much quicker than we did. Moving from managing a personal property to becoming a full-time property manager is no longer the daunting prospect it was ten years ago when so much of the work was manual. If you have passion for the business, a commitment to providing the best experience for both owners and guests, and you embrace the fast-moving changes in technology, this could be the pathway to your future in vacation rentals. So that’s it – 10 Steps to making your business a success, from starting off to...well...we'll leave that up to you! "If I had the chance to do this over again, I’d do just about everything differently. I’d be hiring earlier, and more intelligently."